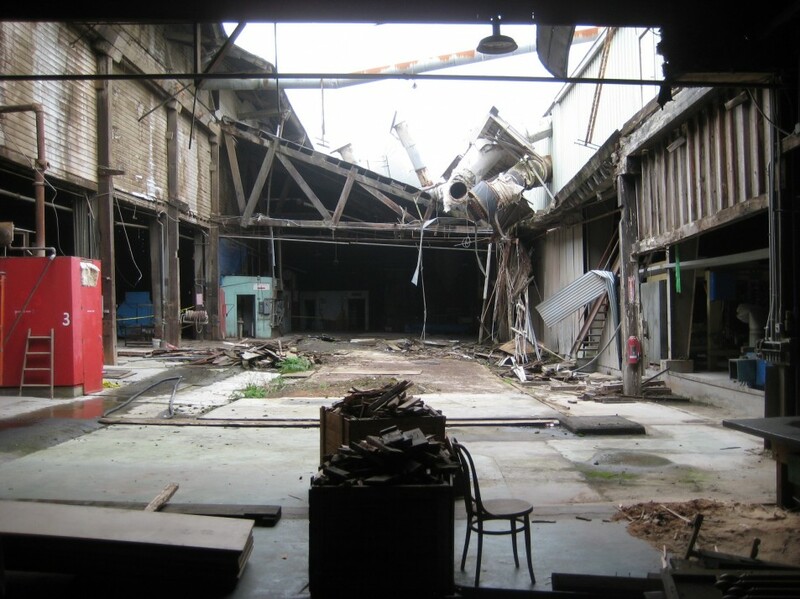 For a half-century, the Linnton Plywood Association mill was a model of worker ownership and democratic control of the workplace. Everyone, from the general manager to the guy who ran the Raimann patcher machine—what one former worker called “a real brain-dead job”—made the same hourly wage, and each had an equal voice at annual membership meetings. All of that was crowned by the promise of an ample retirement from ownership shares that at one point sold for $90,000. But things went sour after the mill closed in 2001. Lawsuits divided workers into opposing camps. A mandate to liquidate the property as soon as possible dragged on for 14 years as offers were rebuffed, reserves depleted and the property value plummeted due in part to Superfund liabilities. Many blame General Manager Jimmy Stahly and Secretary-Treasurer Gail Holter, who kept drawing full-time paychecks until at least 2012 for overseeing an idle plant. The property at last sold in September for $5.75 million, but the $2.6 million that will trickle to former workers or their heirs is likely to disappoint—and it’s still not clear if or when that money will be disbursed. To understand the disillusionment, one must first appreciate the American dream represented by the co-op. In 1984, the Linnton Plywood Association made the first edition of “100 Best Companies to Work For in America,” whose authors noted that LPA members made $50,000 in a good year, not including their share of retained earnings in the company. The co-op also prospered. In 1971, it purchased its 26-acre riverfront site from railroads. Ownership had both economic and intrinsic meaning. “There were Cadillacs, campers and Corvettes in the parking lot,” former LPA Board President Jeff Ingebrigtsen recalled. “We had a better man-hour production than union mills,” Tom Nelson added. Annual accountants’ reports provided by Ingebrigtsen show that between 1973 and 1989, everybody got $13.05 per hour. By 1990, the year the Northern Spotted Owl became an endangered species—putting a crimp on the logging of old growth forests—LPA’s years in the black were over. Many of LPA’s 200 members left, accepting retraining at community colleges and jobs as longshoremen. A smaller group, including Stahly and Holter, soldiered on. In 1992, the mill closed temporarily. LPA members began to receive annual loss letters signed by Holter. On Oct. 22, 2001, the board and membership voted to liquidate by the end of the year. It’s doubtful they understood the full consequences of having waited too long. In 2000, the EPA designated the Portland Harbor, including Linnton Plywood’s 26 acres, as a Superfund site. LPA battled the feds in court, in United States v. LPA, but lost. In the end, a June 2015 settlement handed much of $5.75 million in sale proceeds to the Environmental Protection Agency, attorneys and county taxes. A total of $500,000 goes to the Portland Harbor remediation account, and $2.6 million will be distributed to LPA members due to a lien from a 2014 settlement, Weiss v. LPA. Former workers, who were not notified of the bylaw modification vote, accepted $2.6 million to settle. Letters submitted by former LPA members in support of the Weiss claim contain bitter recriminations. A letter from Ronald E. Thomas accuses managers of cooking the books. Suspicion of bad faith grew over the years after imminent sales were rumored but never came to fruition. Former members say the LPA board and top managers Stahly and Holter did not hold membership meetings or share information. Portland developer John Beardsley submitted a $6 million written offer for the site in 2005. With a financial interest in deferring capital gains taxes, Beardsley Building Development went so far as to purchase a billboard in Linnton to woo the co-op. In a recent interview, Beardsley and Carrollo said the mill’s “for sale” sign was half-buried in weeds and Stahly unhelpful. “Often times, if I came [to his office], he would try to either not let me in or escape through the back door,” Beardsley recalled. In the end, Beardsley was advised that the LPA board “accepted another purchase offer from one of two other offerers,” shows an email he wrote, dated September 19, 2005. Former Board President Ingebrigtsen told the NW Examiner that Stahly and Holter delayed the sale of the mill in order to continue receiving salaries of $10,000 and $9,000 per month, respectively. Ingebrigtsen said Stahly and Holter began receiving that amount after the closure and continued to do so until the money ran out. “We haven’t seen any financial records since we closed,” Ingebrigtsen said. Asked how he knows the amount of their salaries, Ingebrigtsen said, “I was told by several board members. Jimmy told me too. Gail was getting nine-something; Jimmy, 10-something. To run an empty mill. Stahly and Holter did not respond to interview requests until they were presented with a draft of this story late last month. “It is disappointing to read some of the comments you attribute to our former colleagues and others,” reads Stahly’s two-page response. “Those comments are almost entirely false. “First and foremost, the allegation that Gail Holter and I intentionally delayed the sale of LPA’s property in order to continue drawing compensation from the company is false. Stahly doesn’t apologize for drawing a paycheck through 2012. “It is not unusual for a company’s former managers to be paid for this kind of work,” he wrote. Stahly claims he and Holter sometimes worked from home and were not paid by the hour. “It would have been rare for us to work less than 30 hours per week,” Stahly wrote. His former co-workers don’t believe a word of it. “They weren’t even there,” Frank L’Amie said of Stahly and Holter’s work pattern after the closure. “I think they came in once a week,” Rich Mares said. “I could come down once a week for $120,000,” L’Amie said, smiling. “Then go have a beer at the Decoy,” Mares said. One woman who answered the phone of a former LPA member spoke bitterly of the pair. “Something needs to be done to hold these men accountable,” Barry and Debbie Axtell wrote in a letter supporting Weiss. “I know somebody went to [state Senator] Betsy Johnson, trying to get the attorney general to look into it,” Jim Lomnicky said. Ultimately, responsibility for the co-op’s costly drawn-out death lies with the board, which appears never to have had another election after the 2001 closure. Former board members Bob Thomas, Steve Fowler, Marty Erhardt and Claude Leonard all declined to comment. Former LPA President Eugene Elsey died in 2014. One former LPA board member claimed poor hearing. Claude Leonard’s wife warned a reporter that her husband couldn’t hear. Thomas was more interested in asking questions. Mintken described co-op elections as “popularity contests,” and said many cooperatives’ managers and board came from the general workforce and didn’t understand the larger industry issues. “A lot of [the board] didn’t have a lot of business sense,” Ingebrigtsen said. The opportunity certainly saved on commuting time. His home, built in 1908 by a magnate of the Clark & Wilson Lumber Co., which operated on the LPA site until 1948, overlooks the mill. The LPA property sold in September to Linnton Water Credits LLC and RestorCap, a California environmental restoration company. RestorCap partner Andrew Gregg, in charge of the LPA project, did not return calls or emails, but court documents show RestorCap is mandated to convert the site to salmon habitat. RestorCap makes money from the sale of credits “that can be used to offset land based environmental degradation,” its website states — part of a bold new environmental economy. A post-closure estimate document provided by the EPA shows the sale was for $5.75 million. The 2014 settlement in US v. LPA noted that LPA is responsible for $11 million in “unreimbursed past costs” and “past unreimbursed natural resource damages,” but found the sale of the LPA property and insurance proceeds to be sufficient. Former LPA members still have no idea if, when or how much they will see. The EPA document shows a $2.6 million payment for the LPA from the Weiss lien: $2.48 million to be made to 199 listed LPA members for the 2003 settlement ($12,462 each, if divided equally), plus $130,000 for “par value” of membership stock. There’s also a payment of $433,167 to Lane Powell, whose attorney, Bill Hutchison, has long represented the LPA. Ed Trompke, the Weiss attorney, got $25,000. When can LPA members finally expect their checks? “I really don’t know,” Stahly said, peering out from behind gray tinted glasses.